Here you’ll find out everything you need to know about why toddlers develop a biting and hitting habit and importantly, what can be done to stop it. Why Is My Toddler Hitting And Biting? Confusion – Your toddler may find some social rules confusing. For example, some struggle with “pushing” rules. While playing with another child, they may get away with giving little playful shoves to one another. However, as of yet, they don’t know that hard pushing is off limits. It’s difficult for them to determine the difference between a hard and a soft push. Therefore, it takes time to establish that pushing out of anger isn’t ok, but gentle playful pushing is. The learning process – When you think about biting and hitting, it seems obvious to you as an adult, that there are no situations where you would bite somebody else! However, your toddler doesn’t know this. To them, when they get frustrated, biting or hitting could be the first natural reaction and as they’ve never tried it before, they don’t know that it’s not acceptable. At the moment they have no idea how to express how they are feeling. Until they learn to put it into words, the only thing they can do is express themselves physically. So, anger, disappointment and frustration can all lead to unsavory behavior! It is your job to teach them the right ways to channel their emotions. Revenge or power – Of course, some children are a little more “strong-willed” than others. So, biting and hitting doesn’t always stop just because they know it’s wrong! Once your toddler reaches preschool age, they likely already know the rules surrounding physical outbursts. So what causes them to act out and do them anyway? It all comes down to revenge and power. It could be another child has taken something of theirs, or perhaps they’ve even been rough with your little one. In retaliation, your toddler could then fight back, hitting and biting. Similarly, they try to see how far they can push the boundaries. In a bid for control, they could use biting and hitting to try to get their own way. As you can see, there are a number of reasons your toddler could be displaying these distressing physical behaviors. It’s important to try and establish what is causing the behavior before you attempt to stop it. For example, a toddler who is biting and scratching purely because they don’t know what is expected, should be dealt with differently to a child who does know the difference. When it comes to solving the problem of biting and hitting, it’s best to start as early as possible. At first, many parents shrug the behavior off as their child simply having a “bad day”. It’s a common phase children go through from the ages of 18 months to 2 ½ years. The earlier you spot it, the easier it’s going to be to correct. Identify the triggers – Biting and hitting isn’t usually random. There could be various triggers that lead to the behavior so it’s important to establish what those are. A good tip is to keep a journal and write down when any biting or hitting incidents occur and what your child was doing at the time. Show them suitable alternative behavior – If your toddler is starting to hit and bite as they haven’t yet learnt what is and isn’t acceptable, showing them alternative behaviors can be helpful. For example, if they go to bite you, putting on a sad face and loudly saying “ouch, you hurt mama”, let’s them first know the behavior is wrong. Then, you could channel more positive behavior by asking for a hug. Another example is if your child hits other toddlers with objects. First, reprimand them by saying “no hitting” and then show what is expected by gently patting the other toddler and saying “be nice”. Both of these examples show how you can redirect the behavior and ensure they know what is and isn’t acceptable. Be firm but calm – If your toddler knows hitting or biting is wrong, but they continue to do it out of anger, being firm and calm is a good approach. Telling them firmly that they cannot hit, while providing a suitable punishment will quickly eliminate the behavior. So what’s a suitable punishment? Say for example, you’re holding your child and they enter into a tantrum because you refused to give them something they wanted. Their response would be to hit you. The best punishment here would be to offer the firm “you cannot hit” and then putting them down. That way, you’re withdrawing your attention which is something very important to toddlers! The key takeaway here is to stay calm. It’s tempting to get angry and some parents have even resorted to biting back thinking that showing them how it feels will stop the behavior. It won’t! It will simply make it more difficult to stop because now they’ve seen you do it. Time outs often work well, as does rewarding positive behavior. Don’t contradict yourself – You see your toddler hitting another toddler, so you go over and gently hit your child to tell them the behavior isn’t acceptable. What’s wrong with this approach? Well, you’re sending mixed messages! You can’t tell your child not to hit when you’re hitting them right now. It really helps to have a plan in your head of what you could do if you do witness your child hitting another. That way, you’ll be less tempted to act automatically in a temper of your own. These are just some ways you can deal with hitting and biting. If the problem becomes quite severe, both parents should work together, where possible, to be strict with ground rules. Sending the child to their room if they are old enough, can be a suitable punishment, along with looking them straight in the eyes as you firmly tell them the behavior will not be tolerated. Of course, even the firmest voice won’t always work if your child has an overly-aggressive personality. If you’re concerned, never be afraid of seeking professional help. There could be a reason for the overly-aggressive behavior that needs addressing. Has your child been through an aggressive biting and hitting phase? How did you deal with it? Share your story below! 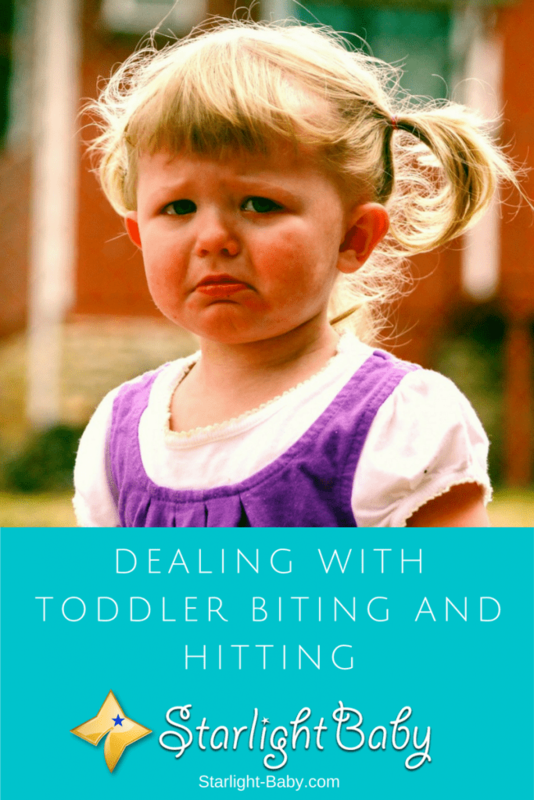 Bitting and hitting is one of the major ways toddlers seems to express their anger and frustration with something. Either that such is discomforting them or that they are just aggressive in nature. It’s not a good thing for a child to take to bitting especially aiming at another kid, it’s on the parents to caution and train their child to seek other ways to express their anger instead of bitting. Generally, bitting isn’t hygienic. In my experience and observation, a child will start hitting and biting even before he/she reaches toddler stage. My baby started hitting and biting when he reached 7th month. We interpreted hitting as “baby’s play” and biting as a way to relax his gums or sooth his gums during his teething time. The toddler stage is different from baby’s stage. The toddler start’s hitting and biting as a way to make people bow to his wishes or anger against something.